Five big names in Christian speculative fiction build an exciting world in serialized novellas, but the effort is marred by poor execution. You’ve probably seen this premise before: five characters with supernatural abilities are brought together to battle unknown enemies and save their world. It’s a concept older than Scooby Doo. But what you haven’t seen before is the format: serial novellas, around 100 pages each, that deliver episodic tales written by five of the biggest names in Christian fiction. 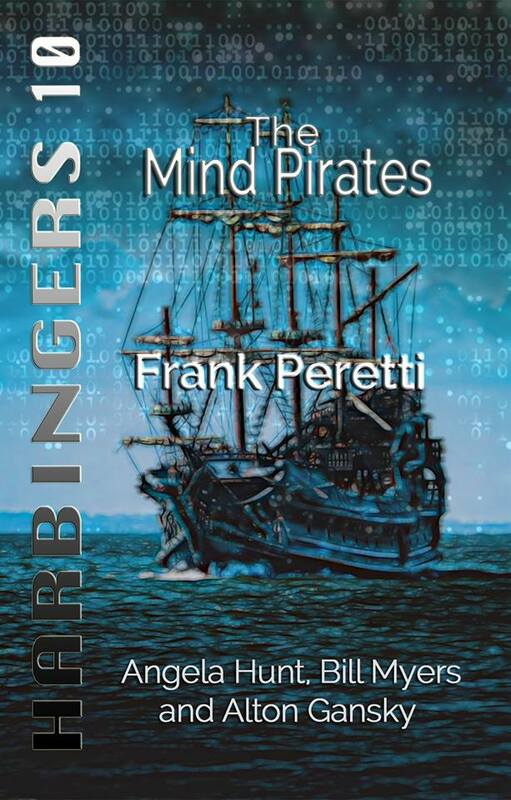 The Harbingers series, written by Frank Peretti, Angela Hunt, Bill Myers, Alton Gansky, and Jeff Gerke, includes fifteen-and-counting episodes of a wacky, fun science fiction experiment that is groundbreaking in concept but mediocre in execution. Myers writes as Brenda, a street-hardened tattooist with dreadlocks and an artistic hand to draw the premonitions she sees. Gansky is Tank (actually Bjorn Christensen, but don’t call him that), a bear-sized football jock with the softest heart and a healing touch. Hunt voices Andi, a fun, nerdy redhead with a mind for patterns and details. Peretti is James McKinney, usually called the professor, a gruff, jaded priest-turned-atheist and the unlikely father figure to them all. And Daniel (not a POV character) is a shy 10-year-old boy who can see into the supernatural and spiritual world. The characters grow to rely on each other’s unique gifts and accept each other’s weaknesses, even when they don’t like each other. They meet in book 1, The Call, in which Brenda tattoos a picture of them onto Tank’s arm—before she’s met everyone else. They wind up investigating a school for the “gifted,” where graduates learn to literally see through other people’s eyes and may be possessed by demons. But this premise ends with book 1, and clues suggesting that each episode connects to the one before it emerge slowly. Across the country and around the world, a secret organization called the Gate has set into motion various schemes to invade the planet. From mind control to monster attacks, their plans often are localized and seem like tests … for now. It’s also unclear whether the team battles foes from an alternate dimension, the spiritual realm, a combination of the two, or something else entirely. The team’s beliefs about the world are fiercely challenged, and their different faith backgrounds cause them to give different explanations for what they witness. However, God’s power is clearly present. Book 13, Piercing the Veil, even explores the difference between using a God-given gift with humility and twisting a gift to do what you want with it. The series brings new meaning to the different gifts described in 1 Corinthians 12:7–11, even though some of the gift-wielders aren’t Christians. Books 11 through 14 feel like a season 1 conclusion and season 2 premiere with the addition of pop-culture-quoting Chad Thorton, cleverly brought to life by Jeff Gerke, founder of Marcher Lord Press (now Enclave). Chad justifies being a jerk and womanizer by also being the smartest person in the room, and he justifies using his extrasensory perception to spy on the team by mentioning how many times he’s saved their lives. The team’s dialogue and reactions are a bit out of character in Gerke’s writing, but his first contribution, Home Base (book 14), is a good one. With the many innovations in how we read that have developed since the start of the digital era, serialized short fiction shouldn’t be a surprise. This isn’t collections of short stories, freebee novellas that supplement full-length book series, or James Patterson’s BookShots. Harbingers really feels like reading a TV show. Multiple authors drawing from their unique experiences highlights this feeling of a fresh adventure each time. But the narrative pace confused me for several books until I realized each story hit about the same peak of suspense and then backed down. Like BookShots, which are geared to non-readers,1 Harbingers could attract a new audience and present a new way of reading—while advancing the cause of independent publishing, which Peretti, Myers, Hunt, and Gansky chose to pursue. But their opportunity is marred by poor presentation. In most of the novellas, I spotted typos, misspellings, formatting issues, and low-resolution graphics. Occasionally the action was hard to follow, key description was missing, or the plot took too long to develop, given the length of each installment. Maybe another reader would overlook such points in light of an interesting story. But shouldn’t the best in the business set a better example? When I read advice to those considering self-publishing or independent publishing, I’m told to hire other professionals to make everything look professional.2 Harbingers is published by Amaris Media, a company founded by Bill Myers, and the authorial team itself does much of the background production on the books. A line in the introduction of most of the books also concerns me: “And if we keep having fun, we’ll begin a second round and so on until other demands pull us away or, as in TV, we get cancelled.” Harbingers isn’t a TV show with a producer watching for ratings to dip too low. The authors are in charge—for better and for worse. It took me a while, but I got excited enough about Harbingers—especially the characters—that I don’t want an early cancellation. I hope the authors feel the same way. Alex Mellen is a graduate of Taylor University and a copyeditor at a small town daily newspaper. She also writes and edits freelance on the side and has been published in Havok magazine. She blogs at http://amediting.blogspot.com.